For a magical after dark experience, wrap up warm and enjoy a walk under the stars at Twilight Christmas. 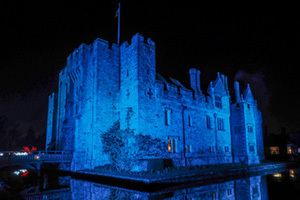 Witness the enchantment of the Castle and gardens festooned with fabulous colours and twinkling lights, capturing the spirit of Christmas. Bring torches and pop on your wellies to see much loved landmarks uplight with glorious colour washes. Explore the captivating Christmas trail and meet characters from the Charles Dickens classic ‘A Christmas Carol’ as you wander around illuminated gardens. Learn about the stories behind some Traditional Christmas Tales as you walk through the Castle adorned with beautiful decorations and welcoming log fires. In front of the Castle, ride the carousel and enjoy vintage fairground stalls. There will also be seasonal dining options available in the café and restaurant.